Business application offering GIS features, Geotrek-Admin allows to draw and manage linear hikings, with sections and topological networks. Incorporating of tourist information systems and geographical data importing - exporting is possible. 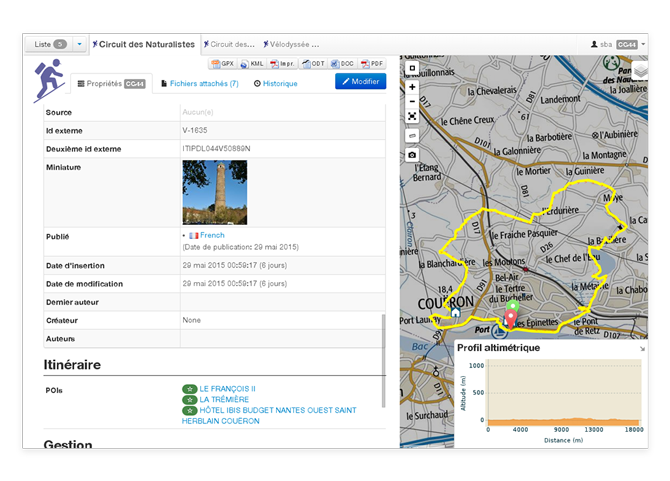 Website dedicated to general public, Geotrek‑Rando allows the promotion of the territory thanks to publication of information entered by Geotrek-Admin. This platform highlights all touristic information as well as local tourism stakeholders. 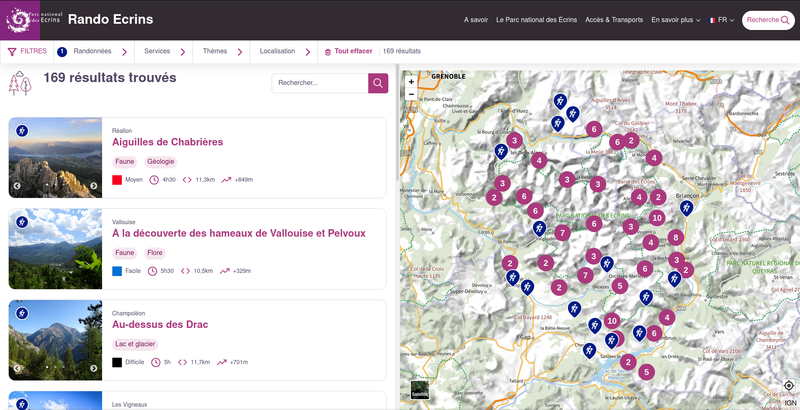 With itinerancy capabilities, the Web portal facilitates the preparation of a hike in the best conditions: advice, descriptive texts, illustrations, Topoguides. Geotrek-Mobile, with its intuitive and user-friendly interface gives access to all field territory informations, offline or online. For families as well as for athletes, it proposes filtering itinaries according to user location and various criterias (duration, difficulty, ascent…). Additional features are also available like GPS alerts, automatic updates, itineraries visialization (departures and arrivals, path, POI…) on a dynamic map, etc. Available on Android and iOS, this mobile application gets a lot of Geotrek‑Rando data. Like on the website, it allows the download of illustrated and detailed topographical guide. Geotrek is a free software which source code is available on Github. The issues and contributions of the community are subject to rigorous reviews. The application suite benefits of a regular maintenance which guarantees a set of high-quality tools. Geotrek is well documented and released under free BSD licence. It can be installed and modified by its user without depending on any provider. The potential benefits shall concerns the development, data integration, training and maintenance. Independence, collaboration and support, the spirit of free software expresses the wish to make the progress of knowledge accessible to all. The Geotrek therefore is growing every day since its first release.